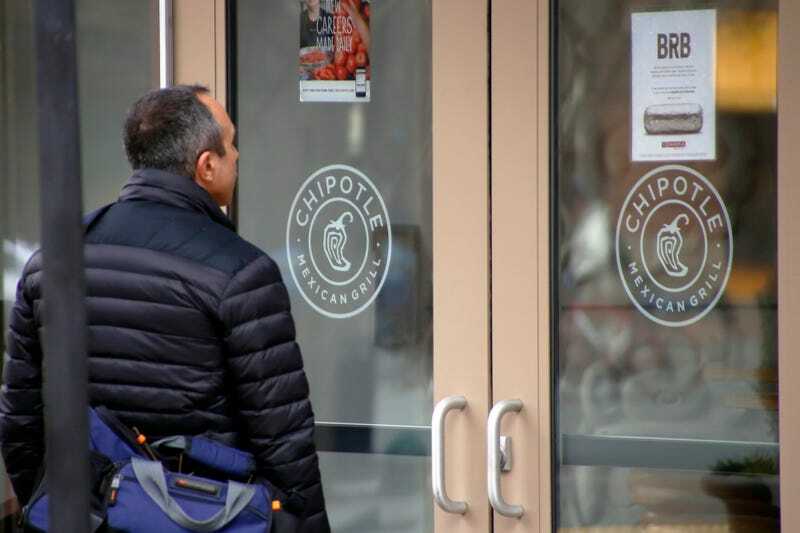 According to a Reuters report at CNBC, a Chipotle outside Boston, in the town of Billerica, has closed down temporarily for a “full cleaning” after four employees fell ill.
“No customer illnesses are connected to this restaurant. Any employee who reported feeling ill will be held out of the restaurant until they fully recover,” Arnold added. Chipotle is trying to repair its reputation after suffering several food-related illnesses, including two E.Coli outbreaks that sickened about 50 people in 14 states and two separate norovirus outbreaks in Massachusetts and California. And norovirus, i.e. the one thing (other than Allen’s Coffee Brandy) that will make your friends talk openly about shitting and throwing up at the same time, may indeed be what came to mind when you heard the news about this tragedy in Massachusetts. However, a company spokesman told Bloomberg that it’s “not known” if these four employees have norovirus, so, um, maybe they just had some bad Chipotle, I don’t know.